THE JEFFERSON HOUSE RESTAURANT- Our beautifully decorated lakefront banquet hall is the perfect place to join friends for one of the lively and entertaining afternoons we are offering for groups this year. From line-dancing to game shows to a Hawaiian Luau, our group events have something for everyone and promise to be an unforgettable afternoon that combines good company, great food, and a beautiful trip to the lake. 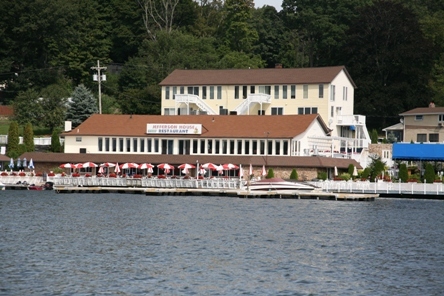 All of our events offer live entertainment and (weather permitting) a narrated boat tour of Lake Hopatcong on the Jefferson House’s 32-foot covered pontoon boat. Please call Robin at 973-663-3063. All events are from 11am-3pm & feature beer, wine and soda from noon -3pm, coffee, tea & dessert. Each event scheduled before October 15th will also include a complimentary narrated boat tour of beautiful Lake Hopatcong. All events are $34.00 per person. Group Leader is complimentary with parties of 40 or more, bus drivers are always complimentary. To book an event for your group or for more information, please contact Robin at the Jefferson House 973-663-3063. We look forward to sharing the afternoon with your group. "Chip off the OL Blarney Stone" Beef Shepherds Pie, Fish & Chips, CornBeef & Cabbage, Irish Potato Patties, and Dessert. Aloha!! Come try out your hula & compete for the best Hawaiian outfit. Attend our luau complete with Teriyaki Pork Loin, Hawaiian Pineapple-glazed ham, Coconut Chicken, Polynesian Ravioli, Vegetable, Potato and Dessert. Enjoy an Italian Luncheon Buffet of Caesar Salad, Meatballs, Sausage & Peppers, Pasta Primavera, Chicken Parmesan, Italian Green Beans and Cannolis. Roast Sirloin, Turkey with Stuffing, Baked Virginia Hm, Yams, Mixed Vegetable and Pumpkin Pie. Listen to your favorite songs and enjoy a beautiful water view as you partake in our sumptuous BBQ Buffet. Feast on homemade Potato Salad, Macaroni Salad and Cole Slaw with a buffet of Hamburgers, Hot Dogs, BBQ Chicken, and Ribs, Sausage & Peppers and Corn on the Cob and Cake. Go on down to the Big Easy for a NOLA Style Luncheon Buffet of Seafood Gumbo, Louisiana Mardi Gras Pasta, Cajun Chicken, Bourbon Street Pot Roast, Roasted Potatoes, Vegetables, and Dessert.